The Programme for International Student Assessment (PISA) is an international comparative study of student achievement directed by the Organisation for Economic Co-operation and Development (OECD). PISA 2015 represents the sixth such study since PISA was first conducted in 2000. Seventy-two OECD countries or partner economies participated in PISA 2015. In Australia, PISA is managed by the Australian Council for Educational Research (ACER) and is jointly funded by the Australian Government and the state and territory governments. The goal of PISA is to measure how well 15-year-olds, who are nearing the end of their compulsory schooling in most participating educational systems, are prepared to use the knowledge and skills in particular areas to meet real-life opportunities and challenges. It also provides comparative perspectives on trends in achievement in the context of different education systems, school organisational approaches and instructional practices; to enable this, PISA collects a rich array of background data from students, schools and teachers. 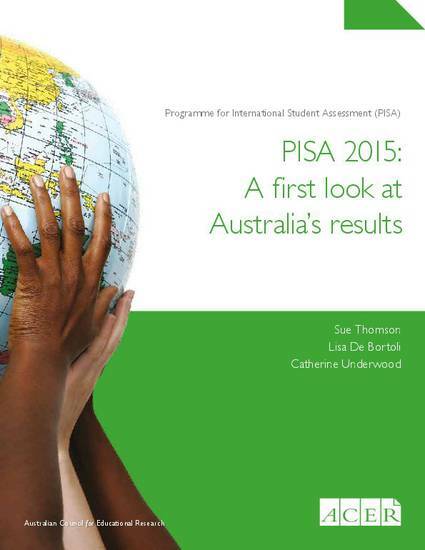 This report is a first look at the results from PISA 2015. This report focuses on the achievement results in scientific, reading and mathematical literacy, and was followed by the full Australian National Report (2017), which examined achievement more fully, and incorporated descriptive and analytical findings based upon the background and demographic data.